Designed for high-performance street 262-400 c.i.d. Small Block Chevys. Manifold accepts late-model waterneck, air-conditioning, alternator and H.E.I. For heavy vehicles, use Performer #350-2101. Will fit Corvette and 1987 and later OEM aluminum heads. Will not fit 1987 and later cast iron heads and will not cover port opening of Bowtie or LT1 heads. 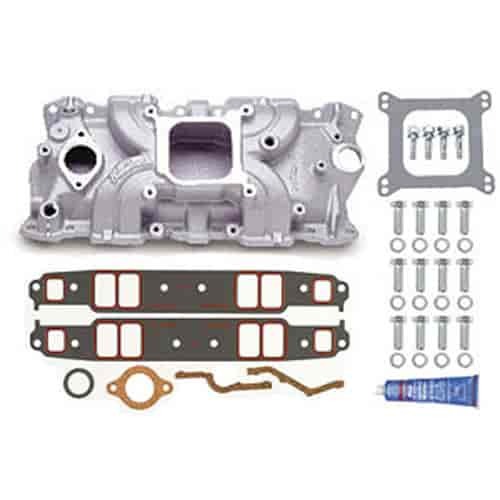 The cast aluminum Edelbrock Torker-II intake manifolds produced for Chevy powered high performance vehicles have a low profile, single plane design that provides adequate throttle response and horsepower gains at high rpm. Since these manifolds are designed with a low carburetor pad height they are ideal on applications with limited hood clearance. These high performance intake manifolds do not have provisions for emissions equipment and should not be used if fuel mileage is a primary concern. The Torker-II design produces tire smoking smiles per gallon!